Yaquina Head Lighthouse was built in 1873. 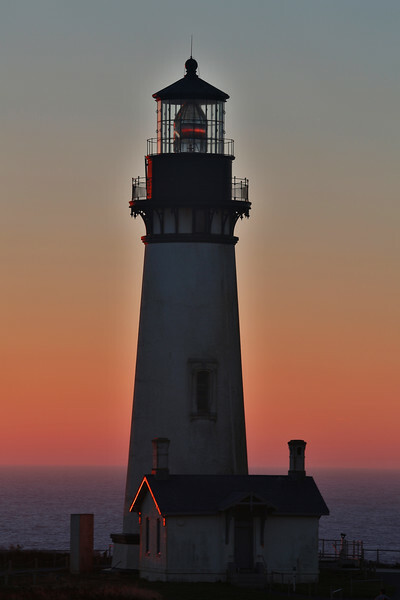 It has a height of 93 ft, making it the tallest lighthouse in Oregon. The light still uses its original 1868 French-made, 1st order, Fixed Fresnel lens; visible 19 miles out to sea. Another beauty! This sunset is a beautiful backdrop for the lighthouse! This is a beautiful shot of this lighthouse at sunset. It's excellent. Wonderful to see it at sunset. This was the first Oregon lighthouse I saw, and holds a special place in my heart. I love lighthouse shots and this one is exceptional.